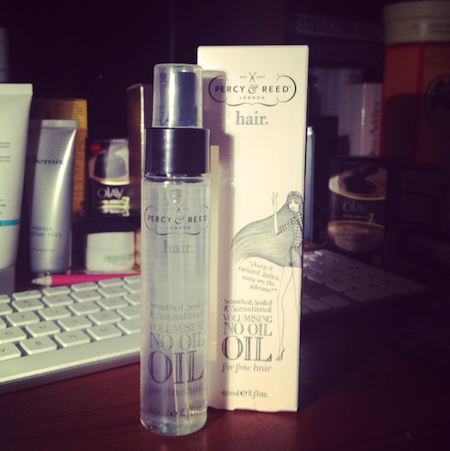 Behold my new hair saviour: the Percy & Reed No Oil Oil. Sounds a bit stupid to say – “no oil oil” – but that is the beauty of online shopping. You never have to ask for things with embarrassing names and you never have to worry that you’re pronouncing things in the right way! You just Google away and SHAZAM! It’s there in the basket, ready to be paid for. No Oil Oil doesn’t have much in the way of oil in it, as you’ve probably guessed. This makes it quite brilliant for people (like me) with fine hair. I have lots of fine hair, but that doesn’t matter: it still gets weighed down if I plonk on too many heavy products. Now, I can hear some of you saying “yes, but you like Moroccan Oil, and that’s oil, you use that all the time!” OK, smarty pants, I do use Moroccanoil all the time, however: Moroccanoil isn’t quite as oily as you’d imagine. There’s a fair whack of silicone going on in every bottle, and really that’s what is making the hair so silky smooth and shiny. The Argan probably does something too, but in terms of surface shine, the silicones are key. I’d imagine that the same could be said for the No Oil Oil. It has this wonderful lightness that’s almost water-like, yet it manages to smooth the hair and add shine. You can use it near to the roots of the hair (so perfect for taming those broken fly-aways near the parting) and there’s no issue with using it on a finished style – it’s so lightweight that you can almost pat it on with your palms. The “tip” on the box suggests running a large powder brush over the product when you’ve warmed it between your palms, and then sweeping it over the hair to tame any rebels, but you could just as easily lightly smooth the palms over. This No Oil Oil has, for the moment, replaced my other oils and my serums too! When I just want to have a down-day and do nothing to my hair, I dry it naturally and work a bit of this through it before it’s 100% dry. It works perfectly. Not a product to use daily if you’re worried about product build-up (it might not be heavy but it’s still layering up on the hair) but I am using it a couple of times a week after washing. It’s great! Previous Post Face Masks that Actually Work!